Be part of the fantasy and participate in our various theme nights, where you could be persecuted by pirates, hunt for a treasure, wander by romantic Venice, or become a Mexican revolutionary, all in the same place. 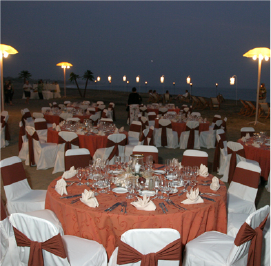 The Grand Isla Navidad Resort offers you unforgettable nights in spectacular venues, lots of fun and excellent food. Here, we want your fantasies to become real.